A baby albatross, which are fed the plastic by their parents. A chick can have an ounce of plastic in its belly and remain healthy; the dead chicks have twice as much. From the Smithsonian Laysan Albatrosses’ Plastic Problem, photo by Chris Jordan. Iron Maiden's modernized retelling helped me reconnect to the story, where it remained melodically embedded in the depths of my subconscious. Decades later I find myself revisiting the tale, for in it there is a lesson for us all. He holds him with his glittering eye— the Wedding-Guest stood still, and listens like a three years' child: the Mariner hath his will. The poem begins with the mariner stopping a wedding guest to tell his tale. The guest is at first reluctant, but the Mariner's gravitas mesmorizes, and he cannot help but listen. The mariner's tale is of a ship and crew leaving from an unnamed port, and soon thereafter being chased by a storm, south into the Antartic. The ship passes through barren landscapes of ice and water with no creatures anywhere to be seen. Cursed by the murder of the albatross, the mariner and the crew find themselves motionless in the sea, as their supplies run out, including their supply of fresh water. This is rendered starkly in a famous line from the poem; "Water, water, every where, and all the boards did shrink; Water, water, every where, nor any drop to drink." The "slimy sea" crawls with "slimy" creatures, and the crew of 200 men become so parched they can not speak, as if they are "choked with soot." Though they can not speak, they each gaze upon the mariner with accusing eyes, and hang the dead bird around his neck to remind him of his crime. After days passed on like this, the mariner sees a speck in the sky that becomes a ship. The ship sails towards the crew without any apparent wind to guide it, and becomes larger. The mariner bites his arm to drink his own blood so he can cry out, "A sail! a sail!" One after one, by the star-dogged Moon, too quick for groan or sigh, each turned his face with a ghastly pang, and cursed me with his eye. After giving the mariner the evil eye, the members of the crew fall one by one, lifeless to the deck. Their souls fly by him like "the whizz of my cross-bow!" For seven days and nights the bodies lay on the deck with lifeless eyes staring at the mariner, while the slimy sea and her slimy creatures surround him. At first these creatures invoke only horror, but as he watches them his heart begins to change, and he sees their beauty. The self-same moment I could pray; And from my neck so free, the Albatross fell off, and sank like lead into the sea. The mariner falls into a deep sleep, and awakens to rain. It soaks his clothing and his body drinks it in. It pours down from one dark cloud, lit by the moon beside it, as a wind in the distance blows. The ship moves supernaturally without being touched by the wind. The crew members, still corpses, become animated by spirit and work the sails as their zombie helmsman steers the ship. As the ship moves on without a breeze, the "sweet" sounds of the crew mix with the singing of birds and the sounds of sails and ocean. The ship becomes still for some time, and then suddenly springs forward. The mariner falls to the deck and lays unconscious; in a trance he hears two voices. One voice asks "'Is this the man? By him who died on cross, with his cruel bow he laid full low the harmless Albatross." The mariner awakens at night to see the crew staring at him with moonlight in their eyes. A gentle breeze blows on his neck, and after some time he makes out the shapes of the shore of his homeland. Mesmerized by the sights he watches until he is sure it is not hallucination. He then notices the bodies of the crew laying prone on the deck, each with a ghost standing above it casting light. A small boat comes out to greet them, manned by a pilot, his son, and a hermit. The ghosts of the mariner's crew disappear and the pilot and his son become afraid, but the hermit stays cheerful and encourages them on. As they near the ship a rumble from beneath the water sounds, and the ship splits apart and sinks. The mariner remains afloat, like a corpse. As the trio take him on board their boat, the pilot and his son lose their grip on sanity. The mariner takes over and rows the boat back to shore, upon which he tells his tale to the hermit, his first captive audience. He finds redemption in the telling of the tale, relieving him temporarily of his suffering. Since then, at an uncertain hour, that agony returns: And till my ghastly tale is told, this heart within me burns. Laysan Albatross (Phoebastria immutabilis) - Kilauea Lighthouse on Kauai, Hawaii. The Rime of the Ancient Mariner is a cautionary tale, reminding us to respect the natural world. The idiom "an albatross hung around your neck" has become a common metaphor for a heavy burden of guilt that becomes an obstacle to success. 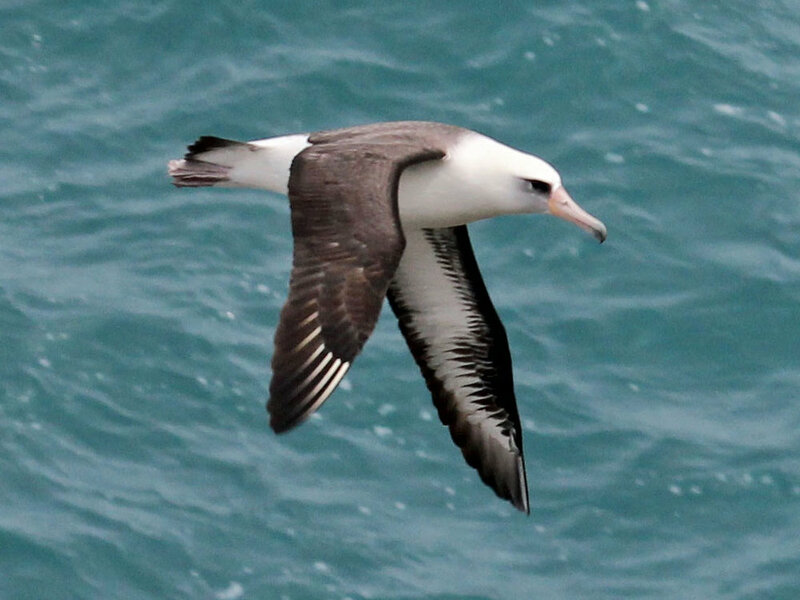 The habitat of the Laysan Albatross is near the Great Pacific garbage patch, a vast "island" of plastic and debris caught by the currents of the North Pacific Gyre (itself the largest ecosystem on Earth). Located between Hawaii and San Francisco, estimates place the patch somewhere between the size of Texas and Russia! Located on the far northern end of the Hawaiian archipelago, Midway Atoll is one the oldest atoll formations in the world, providing a nesting habitat for millions of seabirds. Each November about 1.5 million Laysan Albatrosses return to the Midway for nesting. The Laysan Albatross finds food by skimming the ocean's surface with its beak. They inevitably scoop up plastic, often mistaking it for food. The adult bird is able to regurgitate the plastic from their digestive system, but their offspring are not so lucky. The adult birds unknowingly feed their young from beaks filled with plastic waste. Unable to process the plastics, the young birds die of starvation with bellies full of garbage. I find it daunting to know where to begin in healing the world. Living in NYC, I need only step outside my door to see plastic littering the streets, bags blowing in the wind, styrofoam packaging crushed on the sidewalks. Every time I go to a grocery store or bodega there is inevitably a person in line in front of me that accepts a plastic bag from the cashier, themselves on autopilot, to hold one or two easily carried items. These items already bound in plastic. As the mariner learns, the spirits of nature will one day prevail, with or without us. Japanese scientists recently accidentally created a mutant enzyme that eats plastic bottles. A Dutchman, Boyan Slat, invented a method of cleaning up the Pacific Garbage Patch, involving a 100 km clean up array, deployed for 10 years, that will passively remove up to half of the island of waste. It is comforting to imagine that technology will save us and we can go on as we are, using up resources and forgetting about the waste we create. The wise, however, do not live like this. We should instead be conscious of our consumption and take only what we need. This begins with loving the Earth and all her creatures, ecosystems and offerings. Once we truly learn to love, every act of harm becomes an albatross around our necks.